This miso mushroom pork is a stir fry dish. It’s quick to make and packed with flavours. The main ingredient in this dish is miso paste, commonly used in Japanese cooking. Miso paste is a fermented condiment, mainly made from soy beans and rice or barley, developed with big flavours and nutrients. This time I tried this organic salt-reduced white miso paste that I was quite satisfied with the results. 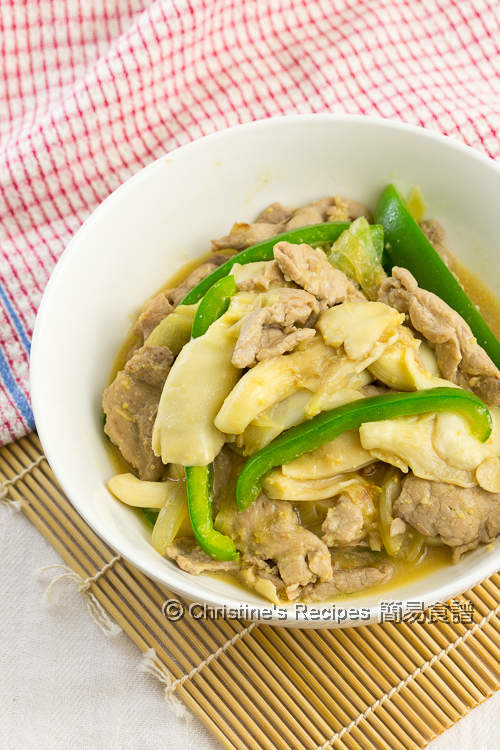 When it comes to making this dish, it’s best to use thinly sliced pork. 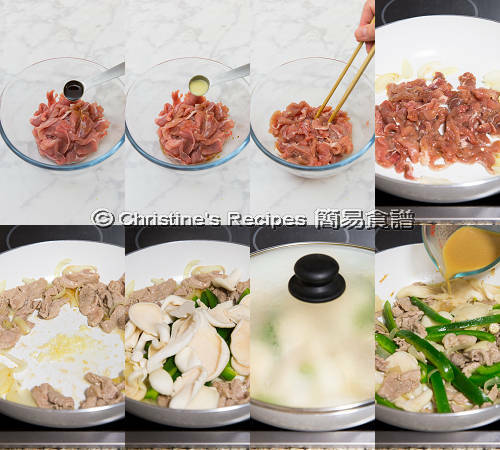 I used the thinly sliced pork for Shabu-shabu (similar to Chinese steamboat) bought from a nearby Japanese store. I found it’s very handy to use. Simply mix the pork with marinade well. After briefly pan-frying, it's good to cook with other ingredients and add the miso sauce. That's simple. Capsicum is my favourite vegetable to go with the pork and miso sauce. This recipe is very forgiving and flexible. 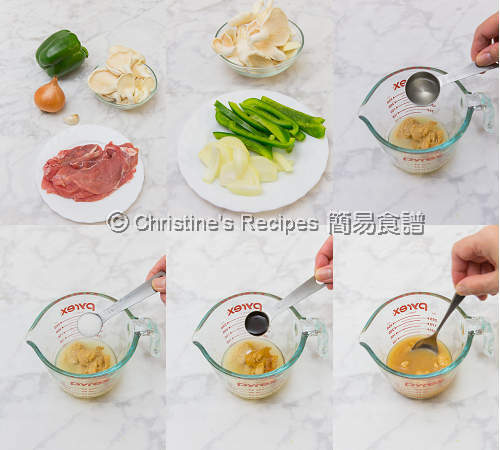 You can add any vegetables of your favourites. My family was amazed with the magic of miso sauce making the pork meat and vegetables taste so good in just a few minutes. Cut the pork slices into shorter sections. Mix with marinade well. Set aside for 15 minutes. Mix all the sauce ingredients well. Set aside. Heat oil in a frypan over medium-high heat. Saute garlic and onion. 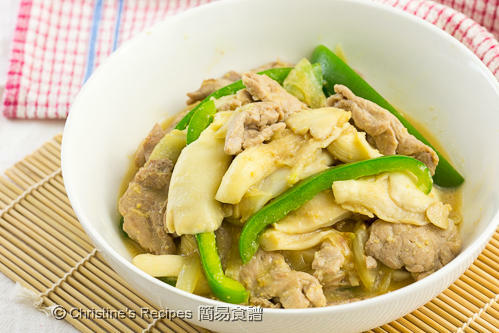 Place pork slices in the pan and immediately spread into one layer, not overlapping each other. Pan-fry until both sides change colour. You don’t need to cook through the pork at this stage as it’ll continue cooking with other ingredients later on. Push the pork to sides of wok. Add oil in the middle. 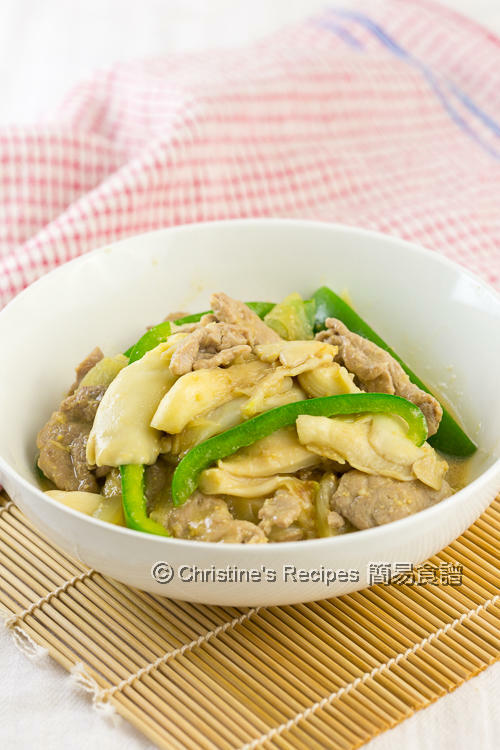 Saute capsicum and oyster mushrooms. Cover and cook for 1 to 2 minutes. You’ll find some moist and steam releasing from the pork and vegetables. Keep an eye on it and don’t let it get burnt. Remove the lid. Pour in the sauce. Bring it to boil. Done. Serve hot. Don’t cook miso too long, as you want to keep as many good and healthy cultures of bacteria inside. Miso paste is available at Asian grocers. 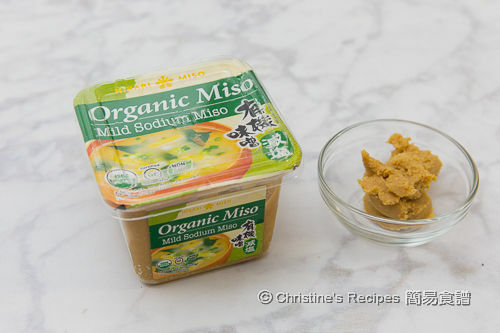 The saltiness of miso paste is different from brand to brand. Adjust the amount accordingly. You might like to use fresh mushrooms or other kinds of mushrooms. Easy peasy...I love quick stirfries like this. Miso must have given it lots of flavours.